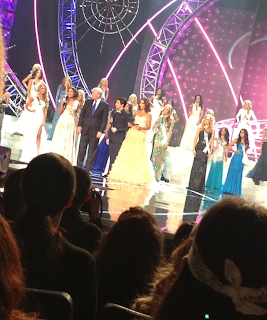 Last night in Las Vegas was the big 2013 Miss USA pageant. And I raced all over 2 malls in Vegas to find a dress and shoes after doing a last-minute meet and greet, where I got to get hugs and even cry for a minute! 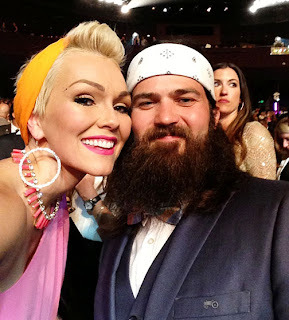 The best part of the Miss USA show, was not that I saw Donal Trump walk by or was sitting behind Pauly D (of Jersey Shore fame), it was that I was sitting behind, Jep Robertson, of Duck Dynasty, and got this picture with him. He was so nice and told me he liked my hair. We also were the only two people in the showroom with some fabric tied around our heads. His beautiful wife, Jessica, was a judge, along with, Betsey Johnson, who I love! There was the Donald with Miss Universe and co-hosts, Nick Jonas and Guiliana Rancic. My favorite part of watching shows that are televised, is watching was happend during the commercial breaks. They change the set, they talk to the crowd, they put sashes on and off of the girls, we saw the Jonas Brothers setting up for their performance. I remember I did the make-up a couple years ago for Miss USA 2012, Rima Fakih, and she was not only beautiful on the outside, but so fun and sweet. Even with Jeannie Mai filming our google hangout with a couple of the contestants, and me offering beauty tips and advice, the girls were just so sweet and real, and talked about how they receive hate and have body issues...they were just sweet and real. After the show, I said hi to the after party, then hurried to my hotel room to change out of my cute, yet painful shoes and run down to BURGR, Gordan Ramsey's "most amazing and dangeroulsy delicious" burger restaurant. And Miss Massachusetts came up to say hi and tell me she has watched my videos for years and that she was one of the only girls that did her own make-up because she learned how to do it from me! I was so honored and felt like a proud "make-up mama" because she looked beautiful! My heart was so honored, humbled, and filled with joy every time one of the girls came up to tell me that, even one of the girls make-up artists came up to tell me he learned everything from me! My heart was so proud of them! I finally found my dress from Guess by Marciano, necklace is from there too. I ran, literally, and got my sparkly "faux diamond" earrings at Bebe, and my mom raced to get the shoes I tried on at Chinese Laundry the day before, but didn't buy them. A had my own vintage clutch and scarf for my hair. 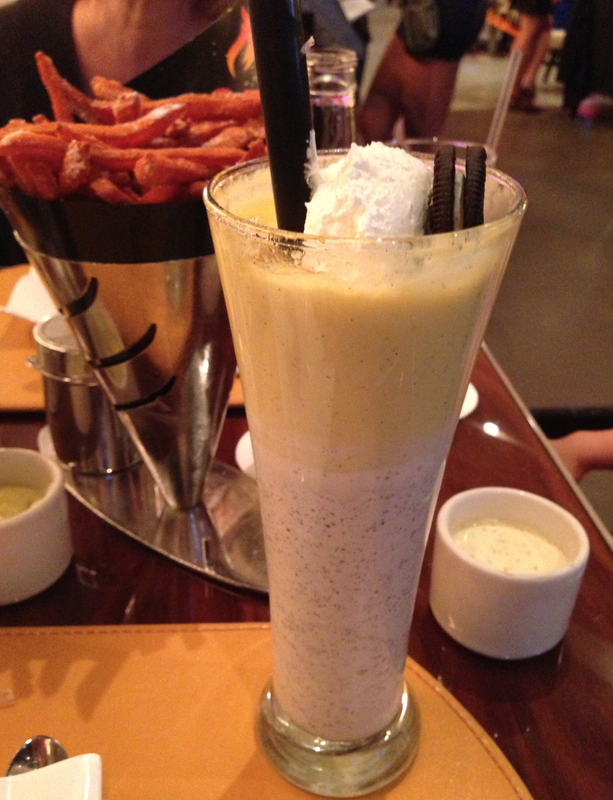 And it's time to say goodbye to Las Vegas....until next time Vegas, I had an amazing time. And I didn't drink one drop of alcohol, or touch a single slot machine...but I am craving one of those milkshakes! And if you wanna watch it, I'll be on a Live Interview on How To Be A Youtube Star for the Wall Street Journal this after noon at 4pm PST and 7pm EST, click here to watch it!